Dose factors are used to convert activity doses into biological doses, converting becquerels (Bq) into millisieverts (mSv). 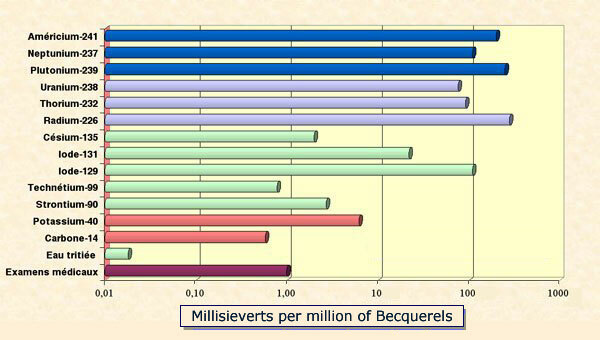 The graph shows the doses resulting from the absorption of 1 million becquerels (mBq) of several radioelements. A logarithmic scale is necessary to represent the great variation of resulting doses.The alpha emitters (in blue) are by far the most toxic elements to absorb. A few fission products are shown in green. Two natural radioelements, potassium 40 and radiocarbon, present in the human body are in pink. The bottom line gives for comparison the average annual dose resulting from medical exams – around 1 mSv.